Shoreline Gallery is, primarily, a studio space for artist Hettie Pittman. Here her beautiful artwork is created then displayed. 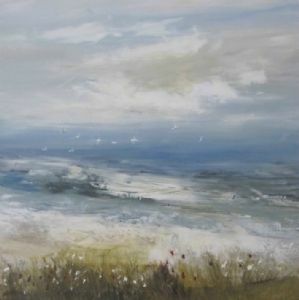 Hettie has been painting for over 15 years and is now a well known name here locally as well as further afield. Her work can be found in many retail outlets throughout Sussex and London as well as being stocked on many retails art websites. She also sells commercially to art dealers and interior designers some of whom she works closely with to create the unique look they seek for their current projects. Her artwork has been featured in many leading magazines, including Coast, 25 Beautiful Homes and more recently Good Homes. It is also featured throughout the website www.luxurybeachhouserentals.com where she has worked closely with its owners to paint unique designs on canvas, walls and indeed the complete inside of a beach hut! 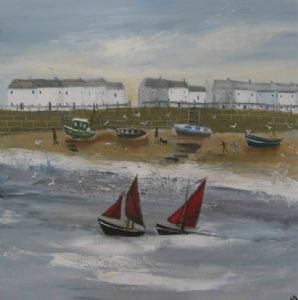 We stock a wide range of her Original Affordable Artwork varying from Seascapes to Landscapes as well as Naive art. With prices starting at just �350 for a metre square canvas there is something for all budgets. For images of the artwork please see the gallery page under the heading original artwork and there you can obtain further details of the style of paintings and some are available to purchase under the gallery page "original art work for sale "
You can also visit our sister site www.artbyhettiepittman.co.uk and if you have any enquiries please do not hesitate in contacting us.